Excited about holding a workshop at Tromsø Academy of Contemporary Art, Norway. See my solo show at Pärnu city gallery until 16.02.2019. Will be holding a special event "Silent Session" with a new sound selection on the 15.02 at the gallery. Great thanks to Vincent Laurelli Kuusk, Estonian Cultural Endowment, photography department of Estonian Academy of Arts and FOKU. Preparing for the show of Estonian Art Museum KUMU collections, opening in July. I chose as a dialogue partner to my work "Social Body" a sculpture from the collection of Estonian Art Museum. Happy to participate at the show Obects of Attention curated by Francisco Martinez at Estonian Museum of Applied Arts and Design, also held a talk there. The talk will soon be available online. Preparing my participation for the show at Estonian National Art Museum at the invitation of curator Eha Komissarov, will be exhibiting Social Body in relation to a piece from the museum's collections. Laura Lehmann from German magazine PAGE published an article about my POP-UP BOOK. Read here. Thanks to Lucy Bourton from It's Nice That magazine for publishing this article about the background of creating my POP-UP BOOK. The article is HERE. 05.2018 Visit Riga Photomonth exhibition at Riga Congress to see my new work "Social Body" on the 2nd floor of the building. The new photo- and VR-video-work for Riga Photomonth is in production. Thanks a lot to choreographer Üüve-Lydia Toompere, to photography department of Estonian Academy of Arts and to Tallinn University Center of Excellence in Media Innovation and Digital Culture. The last event of the series "100 Soundscapes at Studio 335" will be held on the 13th of April at 8 PM, Pärnu mnt 145, Tallinn! This month, Estonian Art magazine is launching its' special number with interviews by artists with artists. I am interviewing Liina Siib in the book. Photos by Mark Raidpere. Estonian Art 20 Launches March 15th at 19.00 at Kumu Art Museum in Tallinn. Happy to be represented by FOKU at the ARTVILNIUS'18 International Contemporary Art Fair in June 2018. Thanks for Funen Art Academy for having hosted me and the dean of Estonian Academy of Arts, Kirke Kangro for artist talk, studio visits and gallery-tour in Odense, Denmark. My work is part of the Monument Contest, artwork by Kristina Solomoukha & Paolo Codeluppi at the exhibition The Work is Not a State of Art, curated by Katerina Gregos at Tallinn Art Hall. Happy to announce my participation at Riga Photomonth group show for the upcoming spring. The show will be held at Congress Hall of Riga and curated by Arnis Balcus. Holding a presentation at the Winter School of Estonian Academy of Arts on the visual signs of self construction in gestures and choices of environment. We are happy to celebrate the new year's eve at our studio as part of the "100 Soundscapes at studio 335 vol3" event! Thanks to Brigita Reinert for the comprehensive review of my work at the Tallinn Photomonth curatoral show in Tallinn Art Hall by Anthea Buys! 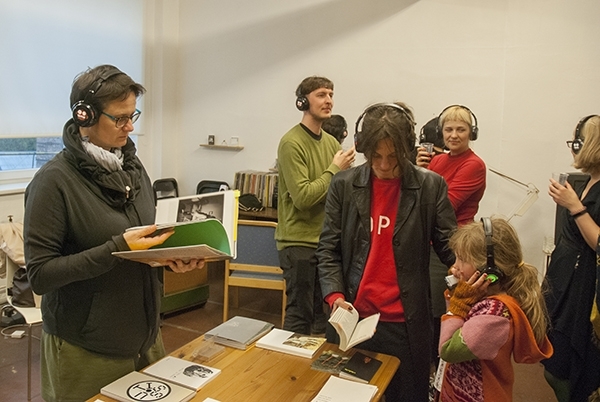 The project Silent Sessions was elected to be part of the art program of Estonia 100. Silent Sessions: 100 Soundscapes is a series of events by Laura Kuusk & Camille Laurelli at their studio in ARS house, Tallinn. During each event, a selection of sounds is proposed to the participants who are equipped with wireless headphones and can walk around in the building while listening. By now, 2 sessions have been hold and the 3rd is coming soon. More information about the event on the site of EV100 Kunstiprogramm. Some documentation of the event HERE. Happy to announce that the so-active Lugemik editing house is again at the New York Art Books Fair MOMAPS1 with my POP-UP BOOK amongst their other publications. See the book HERE.